RED ALERT: Time for you to watch the new Clipping video for “True Believer” from their Hugo Award-Nominated album (#kindofabigdeal), Splendor & Misery. “True Believer” was directed by longtime Clipping collaborator, Carlos Lopez-Estrada, and stars guest vocalist Paul Outlaw as an astronaut floating from planet earth into outer space. 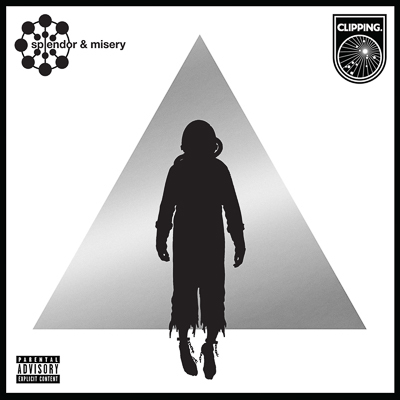 As not-at-all subtly alluded to above, and in further exciting news, Clipping’s Splendor & Misery (watch the videos/listen here) has been shortlisted for the “Best Dramatic Presentation (Short Form)” category of the Hugo Awards (aka Science Fiction’s most prestigious award #NBD), which are given for specific works of science fiction or fantasy in the preceding calendar year. The awards ceremony will be held at Worldcom 75 in Helsinki, Finland on August 11th, 2017. Later tonight (April 4th), Clipping will appear as support for the Flaming Lips in St. Petersburg, Florida at Jannus Live. Splendor & Misery is available on CD/LP/DL/CASS worldwide from Sub Pop right over here and Deathbomb Arc here. The album features highlights “Baby Don’t Sleep,” “A Better Place,” and “Air ‘Em Out,” was produced by the band, and mixed by Steve Kaplan in Los Angeles. The Wriggle EP is also available from Sub Pop, here.